Officials at the signing ceremony ... the contracts will see two out of four phases in Meydan One developed this year. 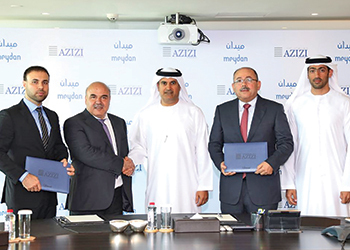 Azizi Developments, a leading UAE-based real estate developer, has awarded two construction contracts worth Dh1.7 billion ($462.85 million) to build 35 buildings in the Meydan One development. The contracts are for two out of four phases that will be constructed this year, the company says. KCC Engineering Construction & Maintenance and Actco General Contracting Company were appointed to build the multi-phase project. At the signing ceremony were Mirwais Azizi, chairman of Azizi Developments, and Saeed Humaid Matar Al Tayer, chairman of the board and CEO of Meydan City Corporation. The developer announced the purchase of 186 plots within Meydan One development last February, which are now amalgamated into 76 buildings. The first phase of 18 low- to mid-rise residential buildings will comprise 2,273 units and retail projects in Meydan One. These will be followed by an additional 17 buildings of 2,162 units in Phase Two. A key design principle will seamlessly interconnect the buildings in a way that is aesthetically pleasing and practically efficient. All of the establishments have been expertly designed to complement the surrounding buildings and landscape. The residences encompass studio apartments, one-bedroom apartments, and two-bedroom apartments. Azizi Developments’ project, located between Meydan and Al Khail Road, is set to become an eminent attraction in Dubai when the first phase opens in 2020.